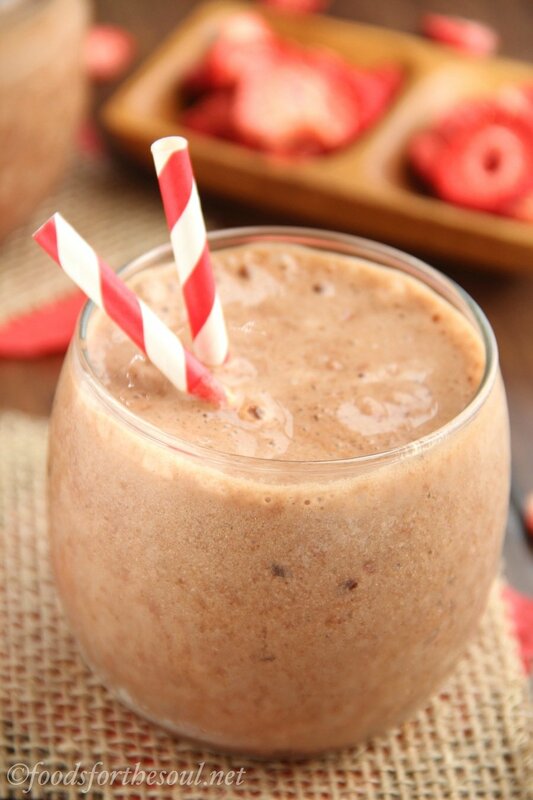 An easy 3-ingredient smoothie that’s really healthy yet still tastes like dessert! A great way to start your day & sneak in a serving of fruit! 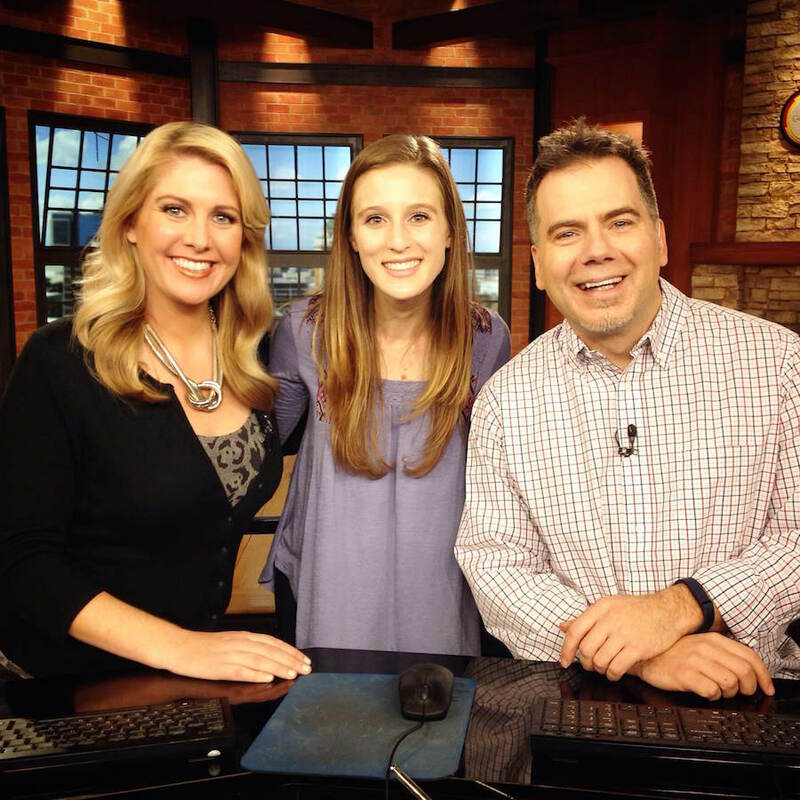 Right around New Year’s, Melissa, a TV anchor on Good Day Sacramento, asked if I wanted to come back on the show. I literally jumped at the chance! She came up with the idea for healthy on-the-go breakfasts: easy recipes that took very little time to make or someone could grab on their way out the door. So bright and early this past Sunday morning, I drove over to the studio with my trunk full of food. I showed up extra early and walked in just after a cute Corgi dog, who was the star of a children’s book, while the entire 18-member cast of the Addams Family musical dashed in from the parking lot as I quietly tiptoed onto the set. Since Melissa loves smoothies and Cody really enjoyed my skinny pumpkin pie one back in November, I brought along the ingredients for another one of my favorite smoothies, as well as my best quiche and most recent muffin obsession. After a little last-minute video shuffling, Melissa and I started filming! Being on TV was the experience of a lifetime and a dream come true. The TV personalities were so warm and welcoming, the backstage hands were funny and friendly, and it was all over before I even had time to get nervous. And to all of you who watched the segment, whether live on TV or the clip above, THANK YOU. Your support means the world to me, and it enables me to continue making blogging my full-time job. I feel so blessed! 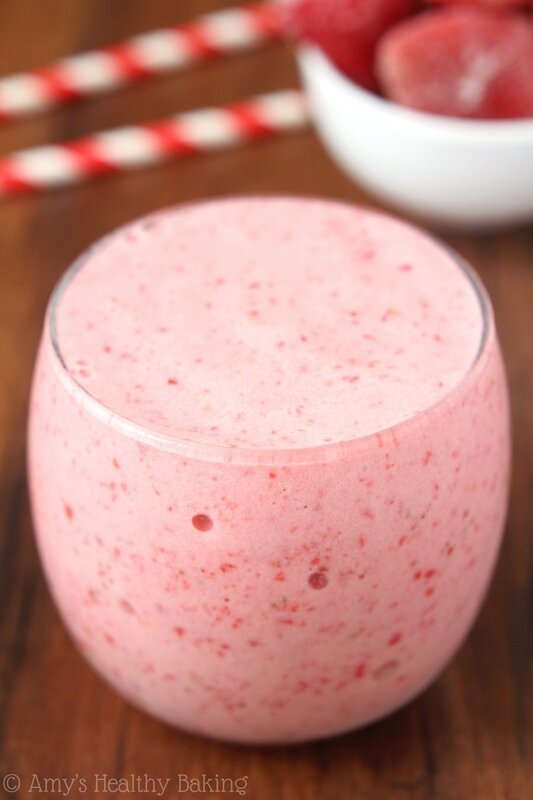 So in honor of the Good Day Sacramento anchors loving smoothies, I created a new one to share with you: this creamy Skinny Strawberry Shortcake Smoothie! It has just 3 ingredients and tastes like the baked treat. Dessert for breakfast is always a big plus in my book! For my smoothies, I’m all about minimal ingredients and maximum flavor. This one is no different! It started with frozen strawberries. I prefer frozen over fresh because they act like ice and thicken the smoothie without watering it down. I always stash a big bag in my freezer because they’re great for baking with too! Next comes the milk. I generally use nonfat milk or light soymilk (Silk is my current favorite!) since my guy is lactose-intolerant. But like I mentioned before, this recipe is meant to be no-fuss, so just use whatever you already have in your fridge. And now for the secret ingredient that gives the smoothie the shortcake taste… Butter extract! Butter extract is sold near the vanilla on the baking aisle, and it’s worth its weight in gold. It’s shelf-stable, keeps for ages, and you can bake all kinds of treats with it too! Like these, these, these, and this. 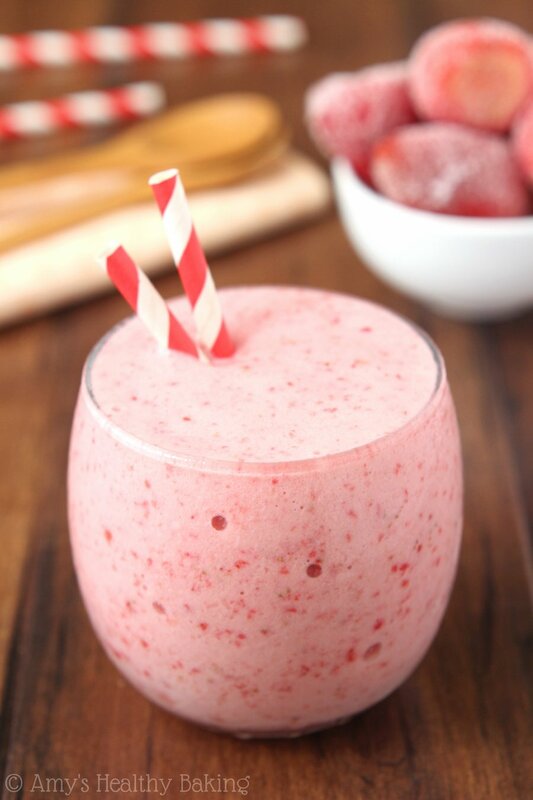 So in a matter of minutes, your Skinny Strawberry Shortcake Smoothie will be ready to help you take on your day! Even with a full serving of fruit and a little protein boost, it doesn’t really taste healthy at all… Just like dessert instead! 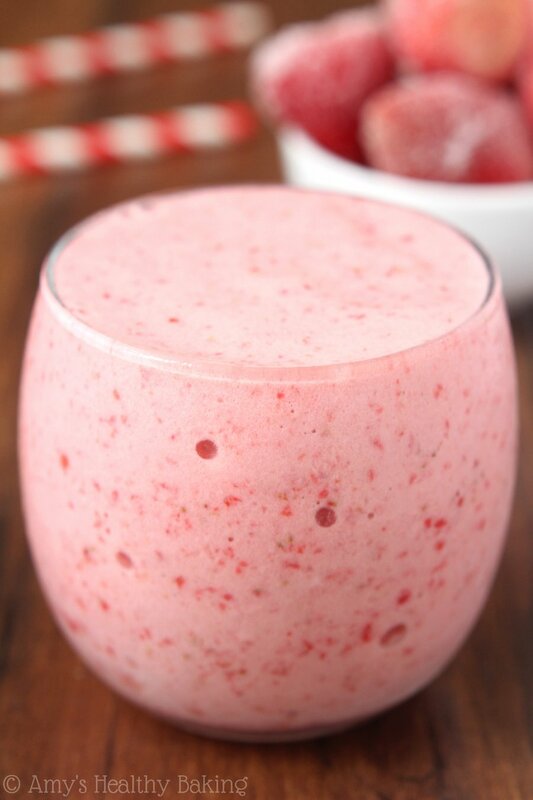 This smoothie is thick, creamy, and full of sweet fruit flavor. The recipe is easily doubled or tripled to serve more too! Add all of the ingredients to a blender in the order that they’re listed, and pulse until smooth. Serve and drink immediately. Notes: Any milk will work! 1%, 2%, almond, soy, coconut… Just use whatever you already have in your refrigerator. If you don’t have butter extract, substitute vanilla extract instead. It won’t taste quite the same, but it’ll still impart some of the shortcake flavor. I’m so glad you enjoyed it Debbie! strawberry to spinach ratio is ok to make it both tasty and healthy. You should have your own show, you’re a natural! You’re so sweet Andrea — thank you! It means a lot to me that you’d watch the video. I’m so glad you enjoyed the smoothie too! Nice to meet you – this looks DELISH for National strawberry shortcake day tomororw! I really appreciate your interest in my recipe Rosemary! My preferred method of freezing fresh strawberries is to wash and dry them, remove the stem, and place them in an even layer on a foil-lined baking tray. Once they’ve frozen completely (a few hours, depending on their size! ), then I transfer them to a zip-topped freezer bag. The strawberries that you froze should work just fine. 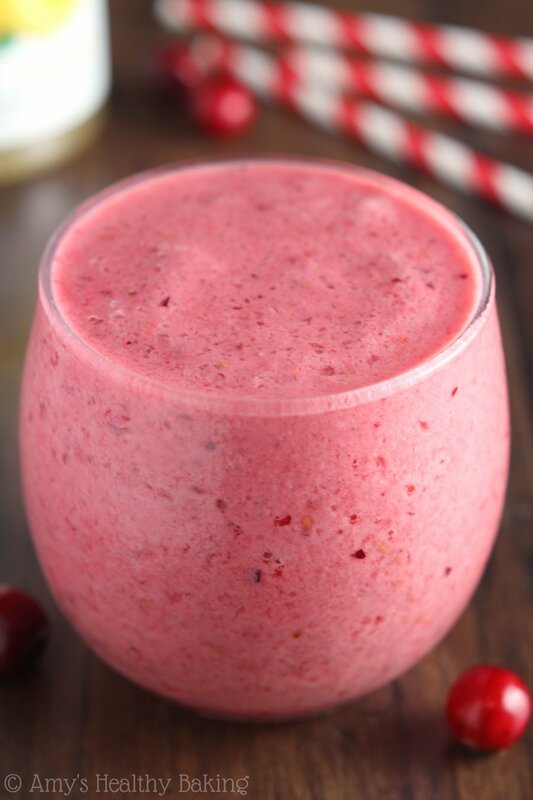 I can’t wait to hear what you think of the smoothie! I’m so glad you enjoyed the smoothie Rosemary! 🙂 I can’t wait to hear what smoothie recipe you pick next! 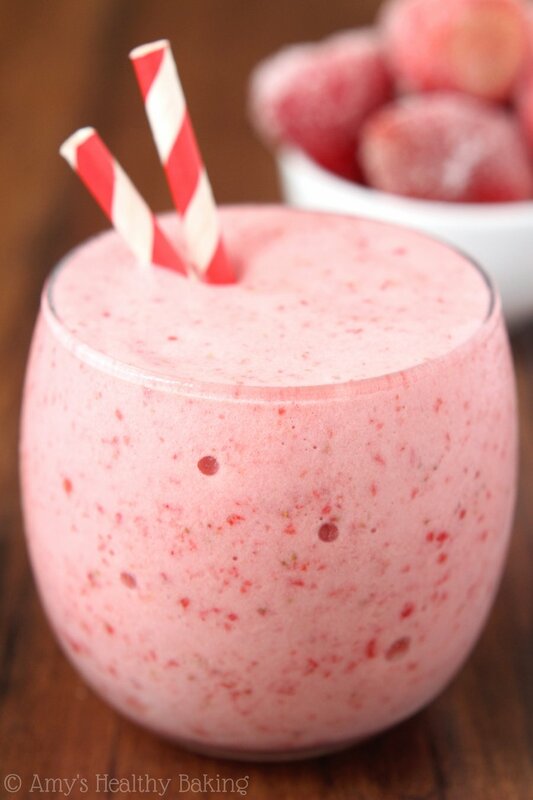 Hi,I just copied down your skinny strawberry shortcake smoothie recipe and I am going to make your smoothie in my magic bullet blender shortly after I buy the frozen strawberries and the butter extract,I already have the the vanilla almond milk and the stevia powder.i will let you know how much I enjoy your smoothie after I make it and start sippling or drinking it.i will make my mom your smoothie as well. Amy,would it alter the taste if I add a little bit of cheesecake in the tub or bar? 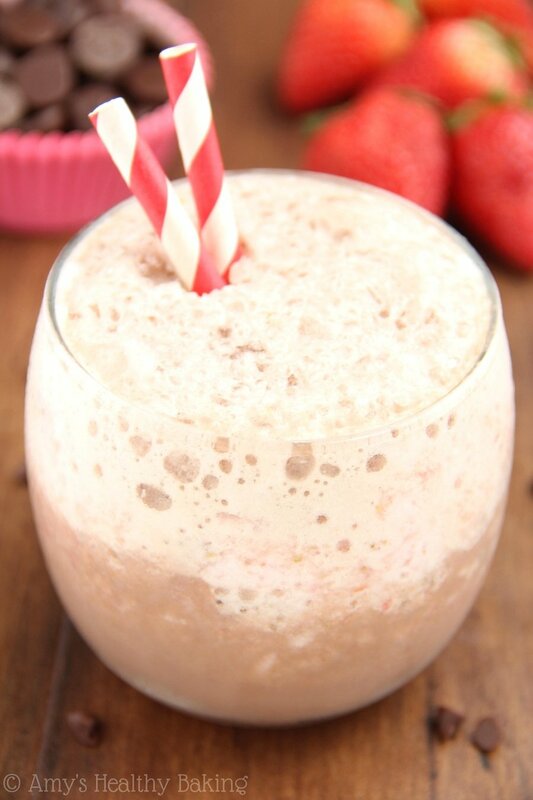 Oh your skinny strawberry shortcake smoothie looks so good and tasty,and I know that I shouldn’t really drink your strawberry shortcake smoothie because the sugars is 16.3g because I am a type 2 diabetic but I want to drink it because I love strawberries,so this will be a once in a while smoothie until I can use a half a cup of the frozen berries to cut back on the sugars in it.